That’s what Larry Hogan could well have said after Democrat Anthony Brown’s latest attempt to fabricate a hoax and then try to sell that bald-faced untruth to voters. Shame, shame, shame on you, Lieutenant Governor Brown. Is this the kind of administration you’ll run? Will you manipulate facts to smear those who oppose you as governor? Will you favor creative political fiction over fact-based reality? Or is this just your win-at-any-cost strategy? It’s a sad day for Maryland voters when a twice-elected statewide official resorts to a level of gutter politics that hasn’t been seen around here in 60 years. It’s even sadder that Brown conned dozens of Democratic officials to join him in promoting this transparent fraud. Brown alleges Hogan wants to cut $450 million from the state’s school construction program. Hogan never uttered a word about such an unheard-of reduction. He’s said just the opposite. Brown chose to magnify a flawed Hogan campaign document that mistakenly used this $450 million figure as a potential budget cut. He employed a leap of logic that even a Harvard-educated man like Brown (actually a twice-Harvard-educated man) should understand. This continual propaganda deception is a blot on Brown’s record. In what has been one of the most abysmal campaigns in Maryland history, last week’s mud-slinging marked a new low. Soon after Brown repeated his Hogan school construction hoax, the Republican candidate responded with a flagrantly bogus assertion of his own: That Brown would wipe out funding for school breakfasts. What a flim-flam Hogan tried to pull. There’s not a breath of truth in Hogan’s twisted version of the facts. No wonder people are turned off by politicians. Lying is becoming an election norm. The irony is that neither candidate needs to engage in such underhanded filth. They are fully capable of leveling with voters and making a persuasive case for their political agenda. This is what Brown and Hogan should be doing. Yet both have decided that unless you distort the truth to the breaking point, you can’t win. 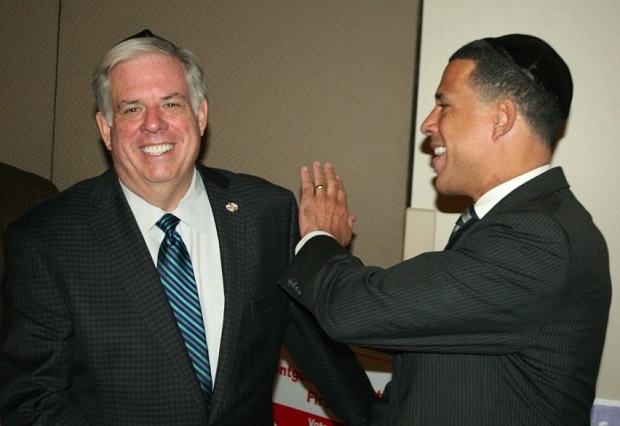 Hogan and Brown would be better off in the final days of this campaign pulling all negative attack ads and telling their paid consultants to take a hike. Creating a wasteland of toxic propaganda may work in Kentucky or Florida or Connecticut — but Maryland is different. Voters here hate that type of campaign nonsense. They’re not fools. They know they are being conned and hustled. Maryland voters don’t like it. There’s no question Brown is the major offender. He’s allowed his handlers not only to go negative but to concoct outrageous lies. I’ve received eight large, glossy fliers in the mail from Brown and his ilk. None gets a passing grade for truth or honesty. All label Hogan as a “dangerous” Republican. All make fabricated charges. All are inflammatory. All take fiction-writing to a new, lower level of disgust. Brown’s campaign insults the intelligence of voters. Yet one of these mediocre candidates is going to win. How the victor will govern is anyone’s guess: Both Brown and Hogan have kept that information a closely guarded secret. Barry Rascovar has been covering politics in Maryland for over 40 years. His writing appears at www.politicalmaryland.com. You can contact him at brascovar@hotmail.com. Tens of thousands of Democratic primary votes are up for grabs in the Anne Arundel portion of Maryland’s 4th Congressional District race. But it is up for debate whether those votes will play a major role in the outcome of the primary election next year.